When talking about the entertainment industry, it’s hard to discuss toxic fans that struggle to separate fantasy from reality. Unfortunately, it’s especially prevalent within the K-pop industry. This past week has been an unkind reminder of those problems, with the reactions of male fans to Red Velvet’s Irene’s choice of reading. 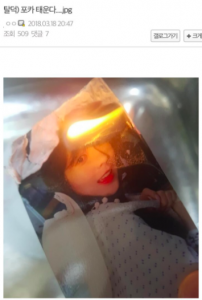 At a fan event earlier this week, Irene mentioned that she had read a book, called Born in 82 Kim Ji-young, and her male fans responded to that information with setting fire to her fan merchandise. Born in 82 Kim Ji-young, written by Cho Nam-joo, was released in October 2016 and follows the unordinary life of Kim Ji-young: her life is modeled on the typical life of a Korean woman, and how she later must seek psychiatric help for all the lasting damages institutionalized discrimination have had on her. It is a book with themes of marginalization, internalized misogyny, and gender based discrimination. Male fans of Irene took this as a personal attack. And it hasn’t just been Irene who has been attacked: Apink’s Son Na-eun recently caught flak by netizens for using a sponsored phone case that said the words “Girls can do anything”. Both of them were attacked for promoting feminist agendas, while also have a male-majority fan bases. 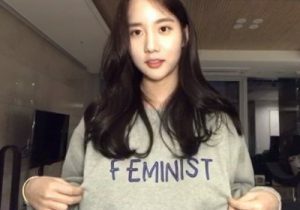 Feminism is a topic that has been very inflammatory within South Korea, but has slowly been gaining more representation and traction through the #metoo movement and through individuals, like Han Seo-hee. Born in 82 Kim Ji-young has been referenced by other major celebrities: Noh Hong-chul mentioned reading it while on Please Call My Name, and said that discrimination was a problem that has not been properly addressed. Actress Hong Eun-hee posted on Instagram how deeply she could relate to all of Kim Ji-young’s struggles, and how she realized that there were many women just like Kim Ji-young around her. BTS’s RM mentioned that he thought it was a thought provoking text during a V-live. Yet there were no inflammatory attacks. No burning of merchandise. No demands of apologies. It’s an uncomfortable phenomenon to witness: what is it about feminism that makes it so taboo within South Korea, and why are female K-pop idols so viciously attacked at even the slightest association with it? Modern feminism has not had the best representation within South Korea. The radical feminist group Megalia is the most readily identifiable figurehead for feminism but often gives the movement a bad reputation. Some members of the group try to empower women by bringing down men, and promoting misandry. Not unlike many other modern societies, the true heart of feminism is lost through the representation by more radical feminists, who dominate the gender equality conversation. This may be the case with South Korea: with some of the public’s understanding of feminism being misandry as opposed to equality, feminism has become equated with man-hating. And while feminism began as a movement by women, for women, it has evolved from that to include all bodies, including all races, all genders and non-gender conforming bodies, all types of sexualities, poor or rich bodies, physically disabled bodies, and all others. Feminist movements– like some parts of Megalia — that claim equality by promoting the mistreatment of an entire group based on identity markers are not truly feminist. Beyond just a mere misinterpretation of a movement, there’s a deeper issue at hand when examining real-life examples. When female idols associate with feminism, the problem isn’t that it is seen as an act of man-hating. The real problem is that female K-pop idols associate with feminism, it directly undermines the system of objectification and fantasy that toxic fans construct around female idols. The K-pop industry markets their idols with the perfect boyfriend or girlfriend fantasy: how many times have boy groups said that their fans are their girlfriends? How many times have girl groups amped up the aegyo during live events? Idols debut with released and carefully constructed profiles and images within their group, which slowly change as their fan base grows and adapts to public response. Their individuality shines through, but their personalities are sort of like blank slates, for fans to daydream about. Female K-pop idols that support the perfect girlfriend fantasy find great commercial success with CFs, drama roles, MC positions, and other different appearances. Through supporting the unhealthy foundations of K-pop and conforming to the girlfriend fantasy, female idols are the perfect canvases to project unrealistic expectations and fantasies onto. Since her association with Born in ’82 Kim Ji-young Irene’s angry male fans have been leaving comments like, “I’m disappointed in her”, “I regret ever thinking of marrying you”, and “Don’t be so naïve to the world. She needs to realize that the majority of her fans are male and it’s wrong for her to make them feel bad when they’re spending money on her”. Each of these fans sets a precedent of shame, as though to force her to apologize for offensive behavior, or for not reaching a specific standard. An interesting theme in Born in 82, Kim Ji-young is the protagonist’s awareness to internalized misogyny, the culture of self-silencing, self-shaming, and her inability to really recognize it for what it is. Similar to the book, celebrities in scandals apologize to the public profusely, before retreating into a period of isolated self-reflection. Modern celebrities answer to the jury of netizens and public opinion: but in Irene’s case, what exactly was the crime? According the account, Irene only said she read the book. So is her crime reading a book? And in a short answer, yes. Irene’s crime was reading a book. By reading Born in 82, Kim Ji-young, Irene subtly undermined a system of objectification, because the book points it out and makes a critique on that system of discrimination. Irene, as a result, becomes a self-aware figure, and that is exactly what an oppressive system fears. When marginalized bodies risk questioning the system that oppresses them, the action cannot go unchallenged. When the system cannot go unchallenged, privileged bodies are at risk to losing a system that gives them advantages that they did not earn. And that is exactly why those fans attacked the way that they did: because the object of their fantasies expressed autonomy and self-awareness. A person with autonomy cannot be a fantasy, because a person isn’t a fantasy. Irene, in an offhanded comment, reminded her fans that she is more than just her K-pop persona, and that was her gravest crime in the eyes of toxic fans. The foundation of toxic male fan culture is the objectification of female K-pop idols. Through her admission of reading a book with feminist content, Irene disturbed that foundation and reminded those fans that she is still a human beneath the fantasy they can project on her. Male fans need to remember that K-pop idols are still human beneath their professional persona, and they also need to realize that feminism is not just about hating men. Incidents like Irene and Son Na-eun should not be met with shame-built responses by the netizens and public. Instead, these incidents should be normalized and make feminism a topic more accessible for discussion as a social movement for equality, rather than the binary and inflammatory way that it is currently perceived as.